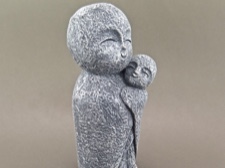 Considered one of the most beloved divinities in Japan, Jizo is the guardian of children and mothers. 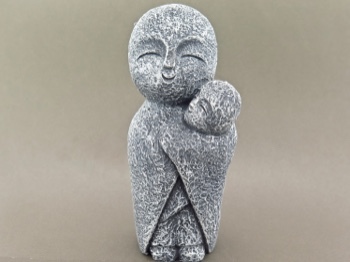 In traditional Japanese Buddhist teachings, the Jizo protects unborn babies. As they did not have a chance to build up good karma on earth, Jizo can lead them into the afterlife in the sleeves of his robe. This idea is comforting to mothers who have lost their babies. It is common to see Jizo statues lining temples and cemeteries around Japan. He works to ease the suffering of the living and to answer prayers for health, success and children. 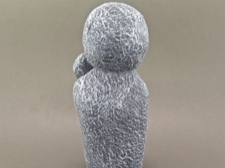 This moonfaced monk is cast volcanic stone standing 5 inches tall with a circumference of 1.75 to 2 inches. A simple, but powerful entity.